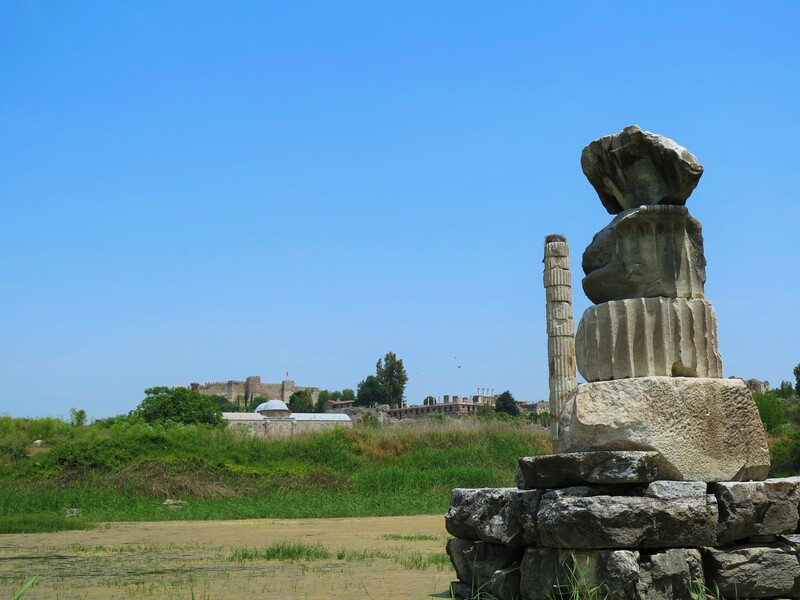 Little remains of the Temple of Artemis. Stray dogs and cats rest by the edge of the small pond that covers much of what is left of the ruins. The water is just a drop of what had been a bay that once lapped at the base of this wonder of the ancient world. The geese that make the green algae covered pond their home have long since forgotten the days when this spot was a bustling port. Aside from the small handful of vendors and the infrequent tourist it was, in contrast to the ancient city a mile down the road, quiet. Tourists pressed in thick at the remains of the city of Ephesus. The weathered white of old stone still stands in stark contrast to the browns and greens of the hill surrounding it. While each stone stands as a visceral memorial to a long since gone civilization, it is hard to say your prayers for the past in a crowd. Of course, the crowds are no reason to skip a visit to Ephesus. The theater that served as the stage for the riot recorded in the book of Acts, chapter 19, enlivens the tale with sight, smell, and touch. The surviving statues of the Library of Celsus are presented in the place for which they were created in a frame no museum could ever provide. The Church of Mary, while young in comparison to its neighbors, ties together the cities vast and varied past with the quiet presence of its crosses. But the crowds do give reason to walk down the road, be quiet, and sit with the Temple of Artemis. In Paul’s mind, he likely envisioned the temple in Jerusalem that would be destroyed soon after his letters were sent. When Paul used the term “temple” he was describing a commanding structure of majesty that provided a dwelling place for the divine. Our bodies and earthly relations were not prisons to be escaped from, he argued, but grand structures to be celebrated and treated with the respect they deserve. And yet, this temple which Paul had known and walked by, of which the early Christians in Ephesus were so familiar, has all but disappeared. My quiet moment staring at the one remaining column and few standing blocks of stone was a solemn reminder, I am a temple. I too someday will fall into the sea. I will fade away and all that is left shall sink into the ground. But to know the destruction and decay of these ancient temples does not rob Paul’s analogy of its power but gives them fullness. There is no permanence in this world, for Creation does not describe an event but the ongoing state of the world. We were created, died, and now we are created anew. The fate of the Temple of Artemis, the fate of any temple, is one that need not be feared. Death, and collapse, have lost their sting. This process of decay is not an inherently ugly one. There was beauty in those remaining stones and still value in the ones that had already returned to the ground from whence they had been pulled. Whether human or stone, from dust we have come and to dust we shall return. The brilliance of Paul’s work is always found, not in his condemnation of the traditions and practices of the cities where he preached, but in his ability to affirm the truth that his listeners would have already been aware and deepen that understanding. Artemis, it is believed, was a goddess of fertility. The celebration in that temple was for new life. This was fitting as the temple was on a third life of its own at the time of Paul’s writing. The first had been lost to a flood and the second to arson. The structure stood in the city as a testament of life from death. The riot in Ephesus started because Paul proclaimed the truth that access to this transformed way of living did not need to come through the silversmiths who sold proximity to the divine through their craft. He proclaimed open access being born anew and condemned those who would claim privilege to the God of new life because of their wealth or social standing. Paul is shouting, Good! Good! Good! Life is good! Death is not an end, it has been transformed. You do not need money or status to be reborn. Those who would build up walls and barriers to keep you from this change are mistaken. They do not see that the chains they put on another have become the chains of their own imprisonment. I have fallen into, and I believe many have, a poor understanding of Paul’s condemnation of “the flesh.” We need to understand that he came from a tradition that first and foremost affirms the original goodness of our bodies and the physical creation of which we are a part. “The flesh” that is condemned is only that which distorts what God initially declared “good”. Just because the temple has fallen does not mean it was bad when it was standing. We do not betray our new life by fully immersing ourselves in our own physicality and that of the world around us. Rather, it is as transformed people that we most deeply experience the world and fullness of self. We are all temples ready to fall. The great blessing is that even though these structures will crumble it does not change that we have still been eternally declared good. Timothy King formerly served as Sojourners’ Chief Strategy Officer and now writes and farms in New Hampshire. You can read his thoughts on farming, food, and faith at his blog, Almost Home .